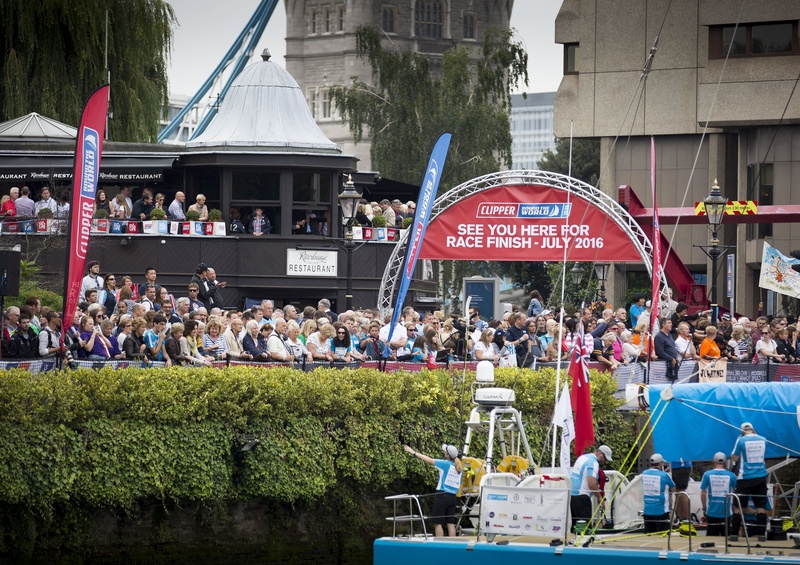 Around St Katharine Docks, the air was full of nervous energy and a sense of anticipation as the Clipper 2015-16 Race crew said goodbye to the thousands of well-wishers that gathered to bid them farewell on their round the world adventure. Following a week long build up in the race village, the time had finally come to slip lines and set off for Southend where the race to Brazil, and beyond, would start the following afternoon. After each team had been welcomed on stage and boarded their yacht, Qingdao, the race’s longest standing Team Sponsor was the first to slip lines at 14.15 to the sound of its team song, Ku Fu Fighting. The other returning Team Sponsors were Derry~Londonderry~Doire, Mission Performance, PSP Logistics, GREAT Britain and Garmin, with several new additions in LMAX Exchange, Visit Seattle, ClipperTelemed+, IchorCoal and Da Nang – Viet Nam. Completing the fleet was Unicef, the global children’s charity which was gifted the yacht by CEO William Ward and Sir Robin to mark the race’s tenth edition. The Clipper Race is billed as an action packed, rip-roaring, thrill seeking challenge, full of highs and lows, aiming to deliver an enormous sense of achievement upon completion, whether that is one leg or the entire circumnavigation. Ahead of the crew lay the excitement of competing in Sydney Hobart Yacht Race and new additions to the race route in The Whitsundays, Australia, Da Nang in Vietnam and Seattle in the USA. One of the 238 crew members to set off from London this day last year was Vanessa Jubenot, a self-confessed fashionista who had swapped her Jimmy Choos for life on the high seas. “I didn’t know if I would be strong enough physically, strong enough mentally, if I would get anxious over hurricanes, if I would be able to cope with the heat,” but having taken on the role of victualler, Vanessa, who had never sailed before signing up, soon hit her stride. “Part of the experience I would say is the most moving and the most profound is being in the middle of the ocean, in the middle of nowhere and to be in a life and death environment,” she added. Whether seeking the lightest of airs in the Doldrums, witnessing breath-taking sunsets in the Caribbean or facing storms of towering seas and hurricane strength winds, every crew member takes away their own individual highlights. For circumnavigator Junior Hoorelbeke one of those highs came during Race 11 from Panama to New York. The enormity of the challenge the race presents and the ferocity of Mother Nature was never more evident than during this tenth edition. Among the crew departing St Katharine Docks on 30 August 2015 were IchorCoal crew members Andy Ashman and Sarah Young, who both tragically lost their lives while racing and fulfilling their ambitions. Tales from fellow crew of Andy and Sarah’s leadership, team work and sense of fun are bountiful, both of them embodying the spirit of the race. Eleven months and more than 41,000 nautical miles of racing later, the crew of the 2015-16 race have graduated and they have some advice to share with the new recruits for the 2017-18 edition. “You get the feeling on the ocean that you can’t do any more or that your body’s giving up. It’s probably the hardest thing you’ve ever done but you will never feel as good about yourself as you do after doing it. You will never make as many friends again as you do on the Clipper Race,” said Kiki Bakker who raced Legs 6 and 7 on GREAT Britain. After completing his circumnavigation, Steven O’Connor, who learnt to sail in his Clipper Race training, carried the torch for LMAX Exchange as the winning team paraded on the River Thames at Race Finish. To relive some of the racing highlights from the Clipper 2015-16 Race, click here for our latest video. If you want to reminicse about 30 August 2015, click here to view the image gallery. Inspired by our crew? Contact our recruitment team to find out how you could take part in the 2017-18 and 2019-20 race editions. Celebrate 20 years of the Clipper Race with us on Saturday 15 October at our anniversary ball in London. For more details click here.